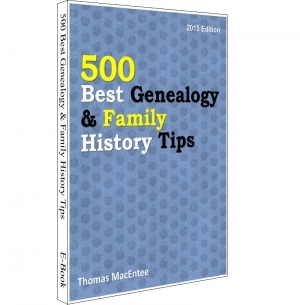 500 Best Genealogy & Family History Tips could best be described as a “brain dump” of me, Thomas MacEntee, and my many years of knowledge about genealogy and family history. Basically what I’ve done is to extract my favorite tips and tricks from over 85 presentations, 10 books and numerous articles. In addition, I’ve reviewed the social media posts and conversations from Facebook, Twitter and other platforms to highlight those issues most important to today’s genealogists. What will you find in this “best tips” guide? Everything from practical ways to use Google, advice on protecting your privacy online, information about secret or little known resources for genealogy research, and more. The best way to use this guide is to browse the Table of Contents to find a topic of interest. Also simply search the book when trying to find a solution to a problem, such as how to cite a source or locate an app to generate bibliographic information. I hope you enjoy 500 Best Genealogy & Family History Tips and put it to good use in the coming year. If you have a great tip or insight to share, feel free to contact me at hidefgen@gmail.com!